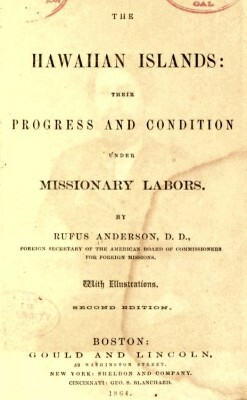 Rufus Anderson : Missionary Progress in Hawaii, 1864. The Hawaiian Islands : Their Progress and Condition Under Missionary Labors. Gould and Lincoln, Boston, 1864.
" Could the Hawaiians of 1820 be placed side by side with the present inhabitants of the Islands, the contrast in their outward appearance would be very striking. The dress of the natives of that period was very simple, consisting of a malo for the male, and a pa u for the female. The kiha was sometimes put on, but not generally ; and children of both sexes were entirely naked till they were nine or ten years old. respects, and send a servant to bring the pa u, and put it on in the missionary s presence, and return comparatively clad. Such are a few of the outlines of the appearance of the people in regard to their dress." regularity than the people do at home ; and the more elevated of them taking part in conducting the affairs of the constitutional monarchy under which they live, holding seats on the judicial bench and in the legislative chambers, and filling posts in the local magistracies. The harbor of Hilo is formed by a coral reef, at the entrance of the bay, extending a couple of miles from an island on the south-eastern side, which is connected with the shore by a number of rocks. There is good anchorage within, and the reef destroys the dangerous force of the waves, though it does not prevent a heavy surf rolling upon the beach at the bottom of the bay. The entrance to the harbor is along the bold western shore, where the water is deep, and the passage free from rocks. Their Progress and Condition Under Missionary Labors. Geoff Cater (2012) : Rufus Anderson : Missionary Progress in Hawaii, 1864.